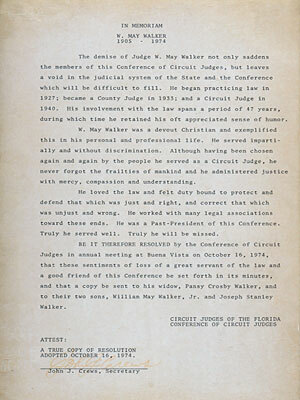 The Honorable W. May Walker was born in Crawfordville, Wakulla County, Florida on May 2, 1905, the son of Nat R. Walker and Alice (Tully) Walker both of Crawfordville. After attending public schools in Leon County he received his Bachelor of Laws degree from Cumberland University, Lebanon, Tennessee in 1927. That same year, after passing the Florida Bar exam, he began the practice of Law in Tallahassee. 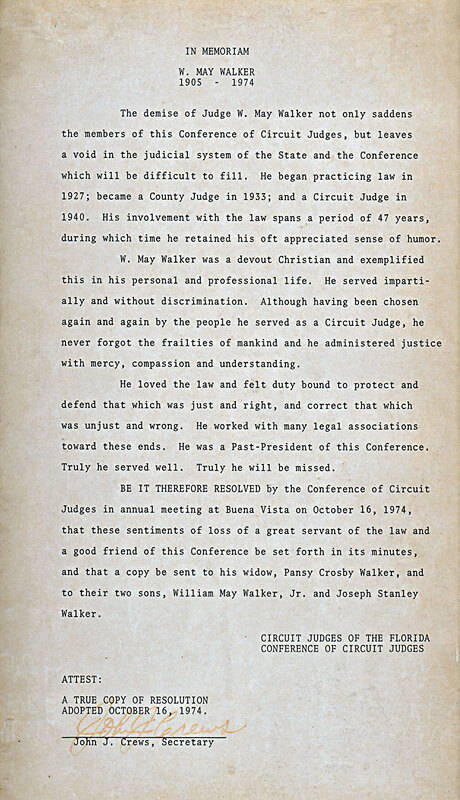 Judge Walker then served as County Judge of Leon County from 1932 to 1940 when he took over the Circuit Court Judgeship after the death of J. B. Johnson. He served on the bench of the 2nd Judicial Circuit until the time of his death, September 16, 1974. He married Pansy Crosby daughter of Joseph and Nora Horton Crosby in 1937 and they have two sons W. May Walker, Jr. and Joseph Stanley Walker. During his lengthy career judge Walker has presided over many important and sensational cases and was one of the most hard-working and distinguished jurists of the State.